The Palestinian Prisoners’ Society (PPS) has reported that Israeli soldiers abducted, on Friday at dawn, two Palestinians, and injured several others, in Ramallah and Tulkarem, in the occupied West Bank. 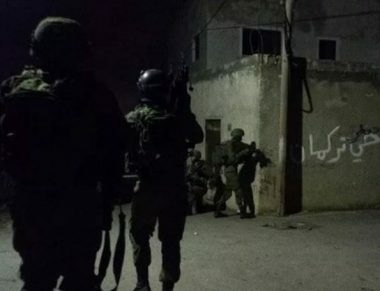 The PPS office in Tulkarem, in northern West Bank, said dozens of soldiers stormed Tulkarem refugee camp, before invading and ransacking many homes, and abducted a young man, identified as Abu Ziad Farhana. It added that the soldiers also fired many gas bombs, concussion grenades and rubber-coated steel bullets at many local protesters, causing many to suffer the effects of teargas inhalation. The soldiers also abducted Ala’ Akram Barghouthi, from Beit Rima town, northwest of Ramallah, after stopping him at a military roadblock, at the main entrance of nearby Nabi Saleh village. In related news, the soldiers invaded the al-‘Arroub refugee camp, north of the southern West Bank city of Hebron, searched homes and summoned several young men for interrogation.